The new design of our high bay light series HBL-AIR combines highly efficient Nichia SMD LEDs 140 lm/W, Meanwell LED driver, light weight magnesium alloy housing with chimney effect in a very compact design. The light beam is adjustable by simply rotating the front zoom lens without tools needed. 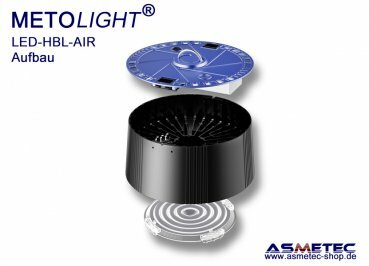 With light beams of about 60 / 80 / 100 degrees this highbay light is ideal for installation heights from about 3,5 to 10 meters. With 140 lm/W it easily achieves energy class A++ and can replace a 250W HQI lamp in many cases. As option you can attach a transparent PMMA lamp shell as anti-glare reflector. The newly developed Meanwell LED driver corresponds to the IP class IP65, is at power factor Pf> 0.97 and belongs to the best power supplies available. It is easy to replace in case of damage. The LED-PCB can be easily replaced by an electrical technician. Installation is simple with steel rope or chain with carabiner for hooking into the supplied eyebolt. We offer 7 years limited warranty (see warranty conditions). We stock only few samples. For bulk orders please allow a lead time of about 4 weeks. Special versions (other CCT, dimmable drivers, extended cords, etc) are available upon request ad additional charge. Please contact us for more details. 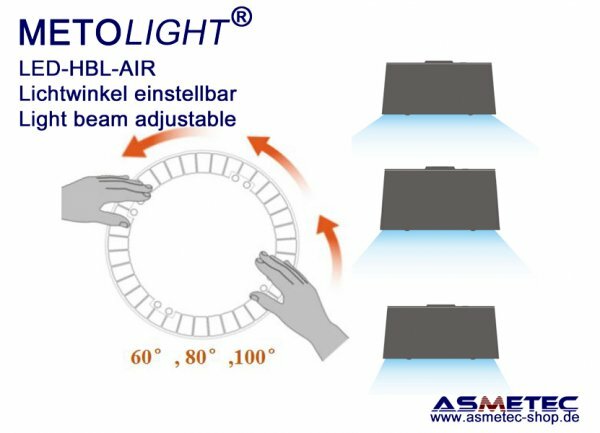 LED-Leuchte für allg. Beleuchtungsaufgaben im industriellen oder gewerblichen Bereich mit fester Installation. LED-luminaire for common lighting applicaions in industrial and commercial areas with fixed installation. 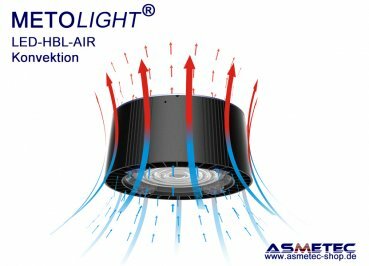 LED-Leuchten enthalten Wertstoffe. Bitte geben Sie die Lampen nach Gebrauch beim Wertstoffhof ab oder senden Sie sie an Asmetec zum Recycling zurück. LED-luminaires contain valuable raw materials. Please dispose them after use at the Local Court of Value Materials or return them for free disposal to Asmetec.